Tis' the season for holiday parties!! Yes the holidays are in full swing which means at some point or another you may be hosting a holiday party or gathering. While I am not having a holiday party, per say, I am hosting my son's 1st birthday party next weekend. As I prepare the menu, decorations and favors I am glad one thing I will not have to worry about is how to collect recycling. Regardless if we have a party at our house or if we rent a hall, finding a way to collect can's and plastic bottles to be recycled used to be such a challenge. The majority of the time I would end up using an old cardboard box and just write "please recycle' on it. You can imagine that it would mostly go unnoticed and you'd see me at the end of a party fishing soda cans out of the trash. Then I was sent a Flings Bin and my problem was solved. Now I have a compact and portable way to gather up those cans and bottles. And they are even cute! The Flings Bins come folded up pretty much flat which makes it super easy to store until party time and then transport to your party destination. When you are ready to use it, simply pop it open in seconds and set it down. It is super easy. If you are using it to collect trash then just tie it up when you are finished and place it in your trash can. If you are using it for recyclables, you'll be happy to know that Flings Bins are recyclable so you can tie it up and place the entire thing in your curbside recycle bin. 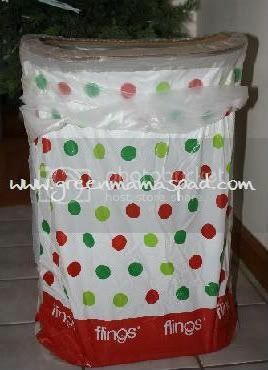 Or if you are like me and prefer to reuse things, you can wipe it down, fold it back up and save it for your next party! I first reviewed the recycle symbol pattern back in June and I still have that bin that I can continue to reuse. I am so very pleased to now have a Holiday Dots pattern as well which is going to look adorable at my son's party. I don't use mine for trash, just recyclables, that way I can contiue to use them over and over again. In addition to all of their every day patterns, Flings Bins has added 2 holiday patterns: Holiday Dots (shown here) and Holiday Beads. SHARE THE JOY - SEND 2 HOLIDAY BINS TO A FRIEND FOR FREE WITH ANY ORDER! You can't pass up this opportunity! Place an order directly with Flings Bins and you will then be prompted to select 2 holiday bins to send to a friend. The Flings Bins are very reasonable priced at around $4.00 each and they come in a variety of designs: holiday, recycle symbol, birthday, picnic and more. They may be purchased directly at the Flings Online Store in packs of 4 or 10. All orders over $40 receive free standard shipping in the US. Flings Bins may also be purchased at Amazon.com in sets or singles. Two (2) winner will receive two (2) Flings Pop-Up Bins in the Holiday Dots pattern. (Sorry you cannot pick a different pattern). Go to the Flings Bins site and tell me which pattern is your favorite. 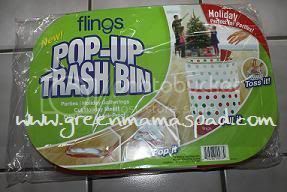 - "Like" Flings Pop-Up Bins on Facebook. Be sure to leave a comment on their wall so I know you did it. This will get you 2 extra entries, so leave me 2 comments. This giveaway is open to US Residents 18+ only and will end on Monday, December 20 at 11:59pm EST. 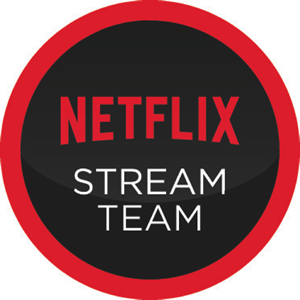 Two winners will be chosen at random using Random.org and will be posted on the Winner's Announcement Page. Winner has 48 hours to claim his/her prize otherwise a new winner will be picked. Unfortunately I cannot guarantee delivery in time for Christmas. You must leave your e-mail address in all of your comment(s) so I can contact you. I will not share your e-mail address with anyone, it will strictly be used to notify you if you win. Good luck! Please note that the opinions and views expressed here are my own and based on my personal experience with the product. You may encounter a different experience with this than I did. Flings provided me with a product for review and is providing the prize for this giveaway. Please note that there are some Amazon Affiliate link in this review. In February of 2009 I introduced you all to Bagnesia. I am sad to relay that Bagnesia is closing its shop. It is unfortunate to see them go as I love their kit idea and they do have functional, cute bags. Since they are closing, they have slashed their prices considerably and are offering free shipping through Decemeber 15. These would make great gifts for teachers, friends, etc. and also good stocking stuffers. The "Reminder Kit" is only $8.00 (regularly $14.99) and individual bags are only $4.50.